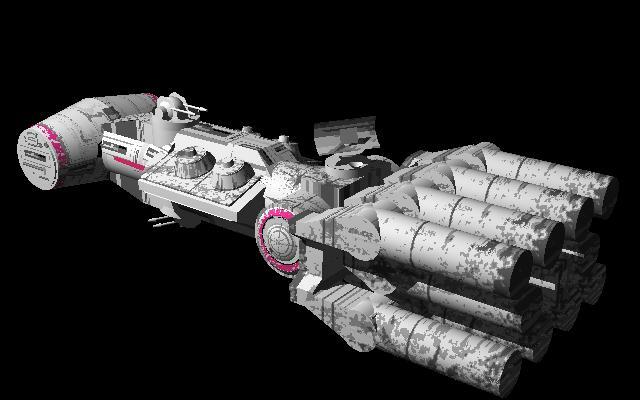 The builder shuttle is a space ship which has a same function, and the same shape that Blockade runners have in the Star Wars saga. 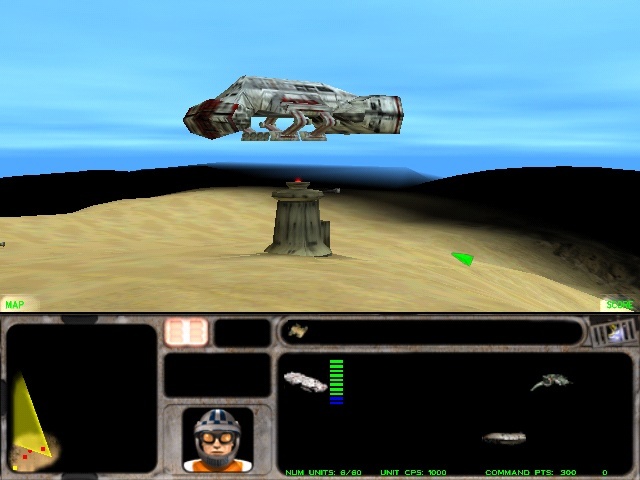 The fast and well maneuverable ships were used for quickly evading a space blockade of a spaceport or a complete planet, therefore it was fast, but poorly armed. Blockade runners were not only used to break out from a blockaded planet, but often used to infiltrate in. Very often blockade runners had to do that in order to transport cargo, for example to bring food, supplies, or arms to a blockaded planet. We could see a similar action in Clone Wars season 2, where Anakin Skywalker had to transport a vital cargo to Bail Organa, who was desperately waiting that in the blockaded Christophsis. Princess Leia also had a blockade runner in the New Hope movie, she was trying to escape from the chasing Darth Vader. This ship was maybe the most popular, and best known blockade runner, its name was Tantive-IV. 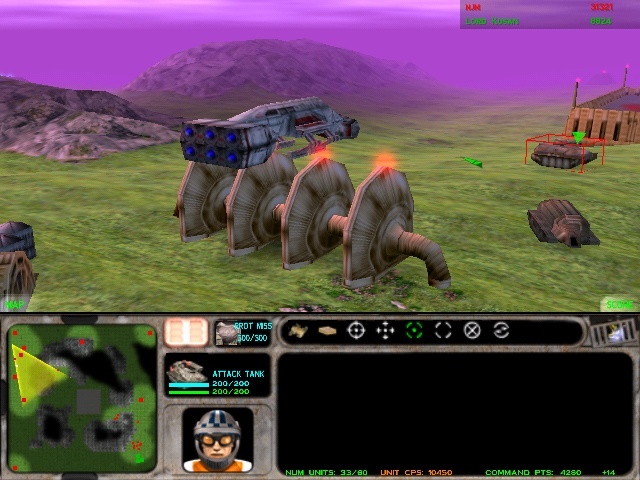 The rebels used of modified blockade runner to transport important military buildings to the blockaded worlds, or even into a battlefield, where a battle was still raging. These ships had mechanic claws, which strongly grabbed the building, and don't released them until the ship flew across the blockade ships, quickly maneuvering amongst them, finally breaking through their lines, delivering the buildings to the designated area. We will study what kind of buildings can be transported with these heavy lifter ships in the game Force Commander. The shield generator was a device used to create a deflector shield against particle and ray substances. The shield generator generates some type of electromagnetic barrier or force field called a deflector shield around the object that needs to be protected. It was designed to deflect or absorb electromagnetic energy, so often these shields can not resist kinetic energy impacts. That is why we can step in its radius, it was what the droid army did in the Battle of Naboo, and also the imperial army on the planet Hoth. 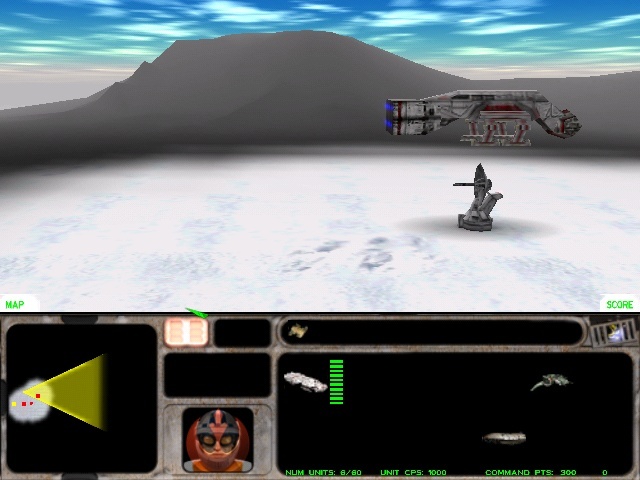 We can throw in a knife for example, like Jack O'Neill did in a Stargate 1 episode, also, we can stab the target object in the shield with a simple knife, like the Delta squad did in the Republic Commando game, destroying multiple droidekas with this method. The shield generator produces the power needed to create and maintain the deflector shield, and focus that shield around a given object, be it a ship, building, or even parts of an entire planet. 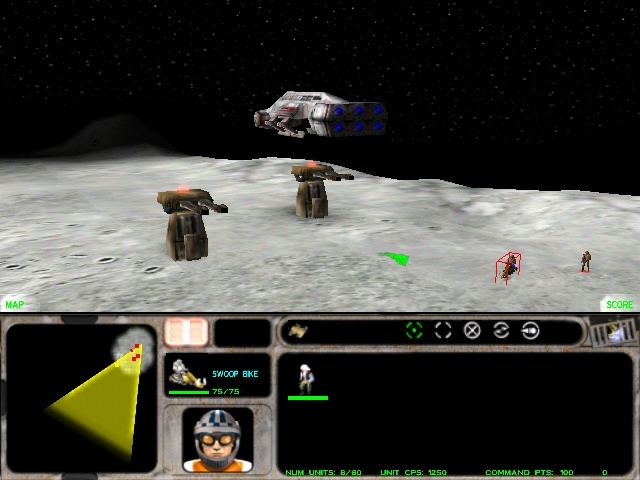 Ground-based installations use immense projectors to generate a deflector shield, like the one that protected the Rebel base on Hoth from orbital bombardment. 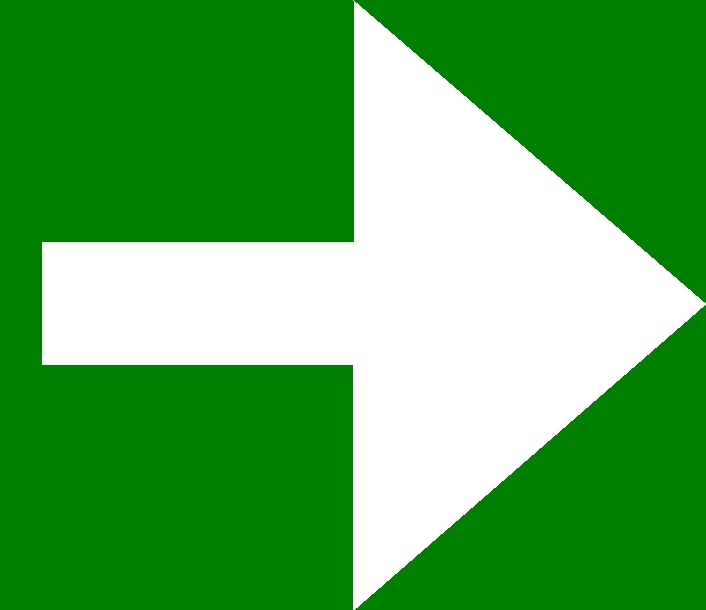 This shield worked in both directions, however, so it had to be lowered momentarily to allow the launching of evacuation ships, because there is no way to get through this type of shields even for solid things. Deflector shield generators were produced in a variety of sizes, ranging from small personal projectors to large units used on capital ships, and even those huge planetary shields. Planetary shield generators, such as the SLD-26 planetary shield generator used to protect the second Death Star in orbit over the moon of Endor, and Echo Base during the Battle of Hoth. The Gungans used both personal and larger shields, too, for example handheld shield generators in the Battle of Naboo, and also shield generators on the back of their Fambaas. The anti-air turret was an armored flak ground installations. The turret itself basically was a powerful flak cannon mounted on a base that allowed it to turn a full 360 degrees in order to defeat enemy aircrafts approaching from any direction. It included its own power generator, removing the need for external linkages and allowing the turret to continue operating even after the destruction of a base's main power generator. Designed specifically for use against low-flying aircraft, especially if they were busy dog fighting each other, or were attempting bombing runs. Since the turret was pre-fabricated, and included its own power generator, a AA gunner sat in it before being transported, and after being delivered to the surface it could start functioning immediately, quickly opening fire towards the Imperial Tie fighters and bombers. The flak pods had an extremely high rate of fire, blasting high-velocity projectiles that ignored shields and detonated with a plasma-like effect at any airborne target. The anti-vehicle turret was a light emplacement weapon built for both the Imperial and the rebel forces during the Galactic Civil War. The turret consisted of a powerful blaster cannon mounted on a base that allowed it to turn a full 360 degrees in order to greet enemy armored vehicles with a really warm welcome approaching from any direction. This turret also came to battle with a gunner inside. It included its own power generator, too, allowing this turret to continue operating even after the destruction of a base's main power generator, so it could work perfectly until it had ammo, had the proper energy, and had shield. The cannon could fire in bursts or single shots. In the short intervals between bursts the gun recharged its power. Even a single AV turret could easily destroy several light armored vehicles, (f.e. AT-PT, mobil artillery), seriously damage middle-weight enemy vehicles, if they come one by one, even 5-6 AT-STs or heavy artilleries can be destroyed, and, in numbers, they can bring down even the most impressive enemy vehicles such as the AT-AA imperial walkers, however a single turret cannot stop a walker, especially if the walker fires its chingun's devastating laser dose to it. The anti-infantry turret was a light emplacement weapon during the Galactic Civil War. Consisting of a self-powered rapid-firing blaster cannon mounted on a fully rotatable turret base, it could easily defeat most attacks by infantry and was particularly effective against soldiers in close formation. If so many infantry units approached in its perimeter, that the gunner could not hit until they get to the turret, the gunners were in danger by the imperial intruders, who could capture these turrets eliminating its crew, turning the AI turret against the rebels. Firing a stream of blasts the AI turret was also capable of damaging or destroying lighter vehicles, though it had little effect on any moderate or heavy armor plate. This turret also came to battle with a gunner inside. The Tracked Mobile Base (TR-MB) was a heavily armored Imperial prototype vehicle that could carry a commander and six stormtroopers into battle and function as a mobile command center. The TR-MB was a prototype ground unit that placed a BHCI in a mobile ground unit, closer to the battlefield. 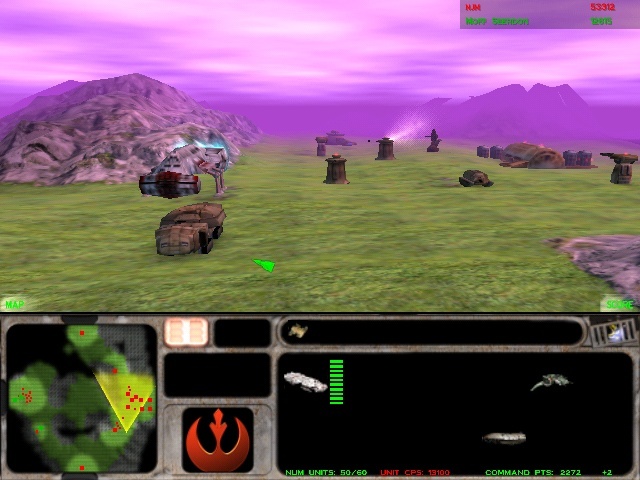 General Brenn Tantor, the foremost user of BHCI technology, made use of it during some battles throughout his imperial career. 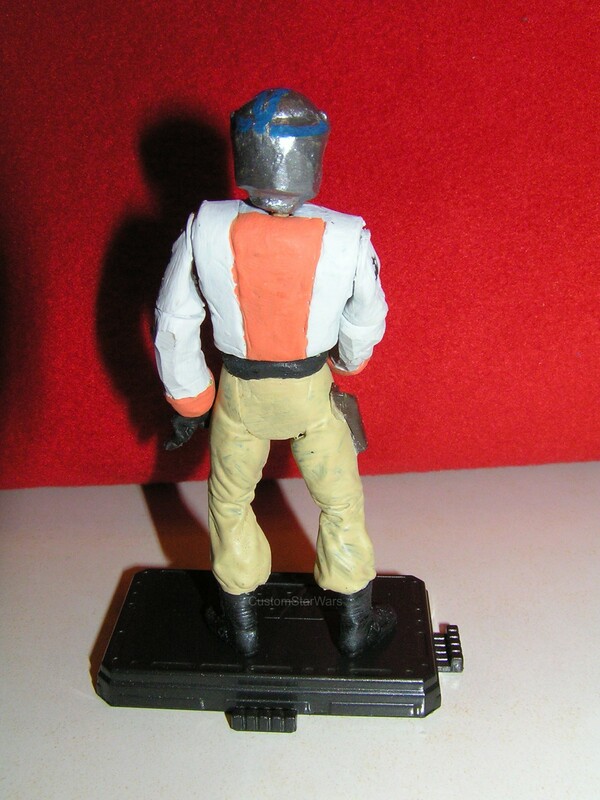 The BHCI (Battlefield Holographic Commander Interface) was a technology, which he used to command a ground battle from an Imperial Stardestroyer. After Tantor was imprisoned, he was rescued by the rebels, and escaped with his TR-MB. The Rebels modified it, adding a set of shields to the vehicle for extra protection. Brenn used the TRMB while being a rebel commander, too, but we do not know what happened with it after the war. Its fate is unknown, the BHCI technology remained in used in a way, however the TRMB prototype was never lived mass productions. 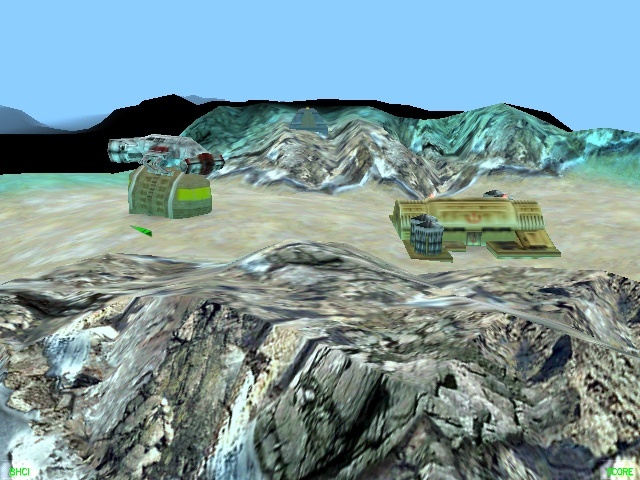 The rebel airfield is a location where rebel aircrafts such as the airspeeders and Y-wings take off and land. This rebel airport had a large flat surface on the top of the building functioning as a runway for the fighters and bombers to takeoff and land. The rebel airfield complex includes control rooms, air traffic control premises, and inner hangars, where any maintenance could be applied on the aircrafts. 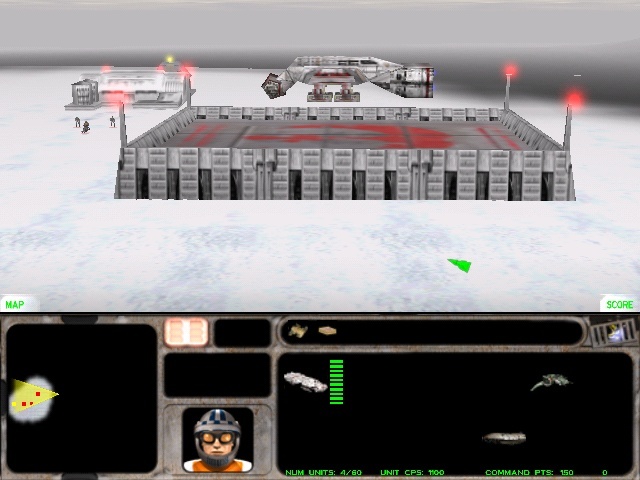 The tech center is a building, where rebel engineers designed special upgrades for the rebel proton attack tanks, which made them more competitive against the strong imperial armored fleet. These upgrades made the attack tanks faster, giving them extra speed, stronger, giving them more health points initially, and could be further upgraded with extra shielding, and finally they became more powerful, after given more powerful blasters and proton rocket launchers, which fire power was quite good after all, even with comparing with the medium sized imperial walkers. The heavy lifter building transporter often has a female driver, who never gets out from the vehicle. If her vehicle gets destroyed, she dies inside. If her ship happens to be shot down, but she survives somehow, she has to have some weapon for self-defence, so I decided to make a a weapon, a rebel blaster in her hands. The heavy lifter building transporter pilots wore a pair of military brownish yellow trousers, and a probably fireproof white pilot jacket with orange parts on it, and an open but heavily armored silver metallic look helmet with blue square symbols on the top area, and some blue parallel stripes in front of the chin area. They have a darkened orange eye visor, kind of sunglasses. I have never seen a heavy lifter building transporter pilot figure before, so I decided to custom make one for me. Like almost all of my custom figure, it needs approx. 15 work hours to finish, but it worth, because its a rare piece. 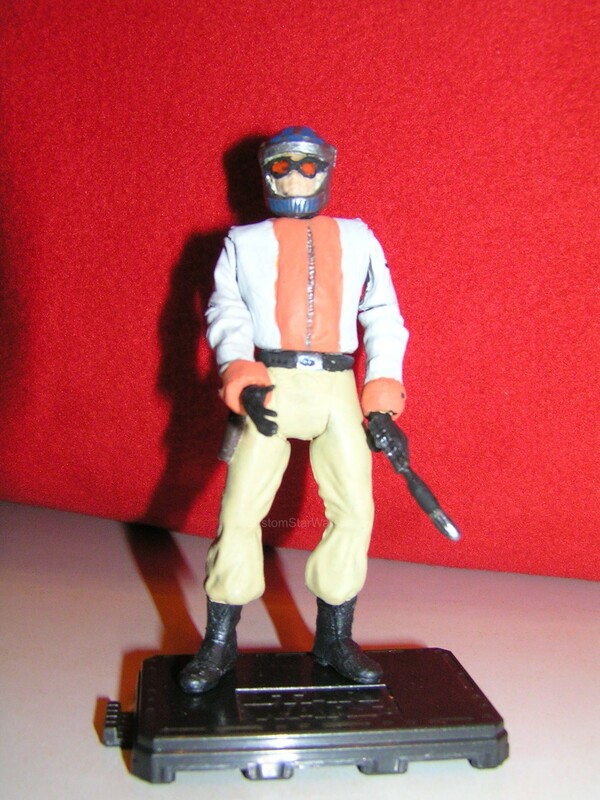 It has different parts from 4 other figures, its legs are from a Darth Maul, the torso is from an Obi-wan, the head is from a Luke, and the hands are from an Anakin. 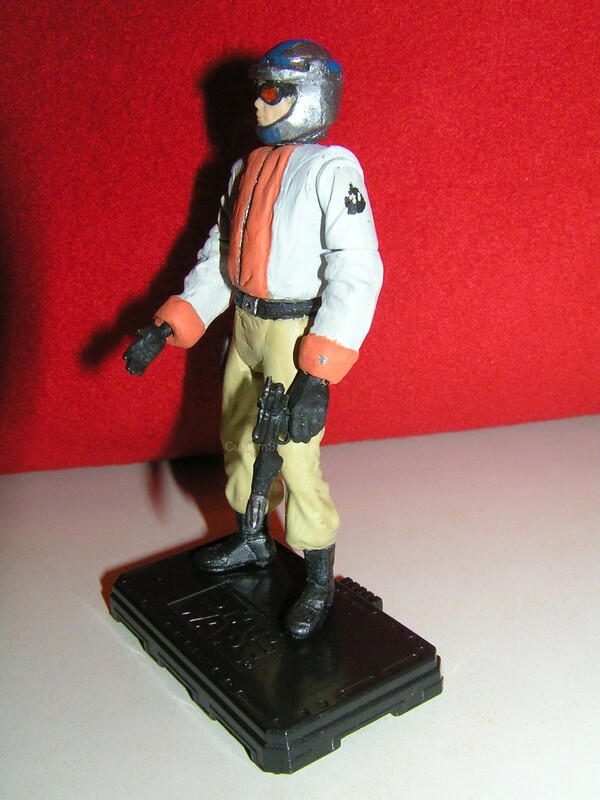 Please take a look at my Custom heavy lifter building transporter pilot figure! It is a valuable piece for me, not because of her difficult colors, and helmet, but also because she was voiced by Jennifer Hale, who I admire. Let's hear some great heavy lifter pilot sentences interpreted by Ms Jennifer Hale! CLICKING a heavy lifter, it will report in with the following sentences! 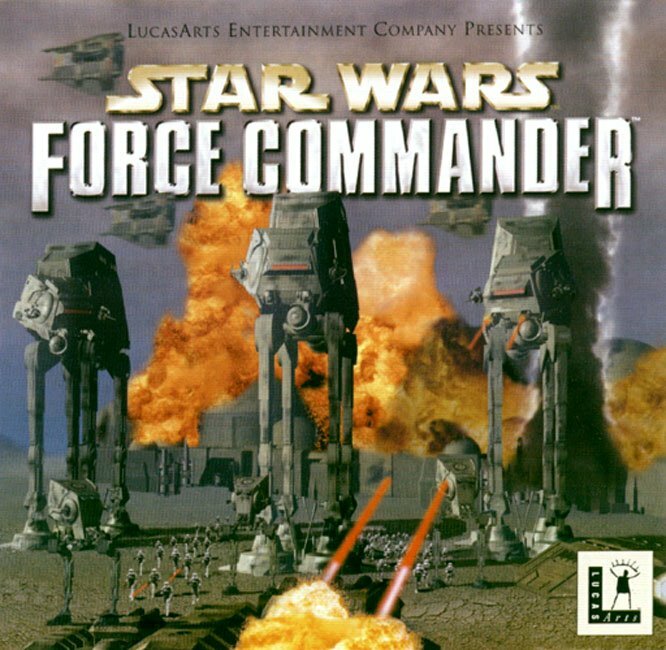 Listen to the voice of the original Force Commander heavy lifter building transporter pilot (MP3) sentences by Jennifer Hale! Where would you like this building delivered? Drop coordinates are in the computer!